Well, I can’t resist a white farmhouse, so I had to check it out. Have you seen it yet? The front door is down in what looks like the foundation (love the stone). Seems like an odd place to enter the house–almost like you’re going in through the basement. This year’s Green Home sits in Serenbe, a picturesque sustainable community about 30 miles from Atlanta. The kitchen mixes rustic with modern. There’s a lot going on in this master bedroom–I can’t say I’m crazy about that headboard against the striped wall and the various patterns thrown together. I need things to be a little more serene in mine. But if I win, that’s an easy change, right? The guest room has what looks like the Rojo Tall Cabinet from Crate & Barrel. Have you noticed that bed skirts and dust ruffles are apparently “out” now? You rarely see them any more. The house, which has 2,300 square feet, was designed by architect Steve Kemp and residential designer Georgia Muncaster of Kemp Hall Studio. The windows on either side of this “Georgia Room”–not to mention the wicker furniture–give it a sunroom vibe that I like. It’s meant to be like an outdoor room, so it isn’t air conditioned. Did you see the Green Home special on HGTV, hosted by Monica Pedersen? I’ve liked her since her Designed to Sell days (I miss that show!). 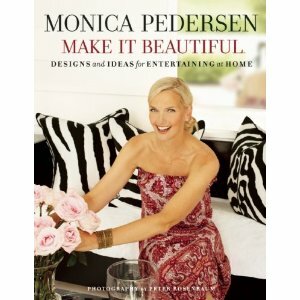 I just finished reading her new book, Make It Beautiful: Designs and Ideas for Entertaining at Home–it comes out May 8, but the publisher sent me an advance copy. I enjoyed it but hope to see a decorating book from her in the future (the kinds of parties I throw these days usually involve pizza delivery and paper napkins–ha). I learned some interesting things about her in the book–like that she started as a print model but was always interested in houses and design. It was a Sears commercial that she landed–playing a housewife with a cordless drill–that got her the audition for Designed to Sell. The rest, as they say, is HGTV history. Like this year’s Green Home? Personally, I would have preferred to have seen more farmhouse and less modern. But overall, I liked it better than last year’s. Want to win it? You can enter twice a day until June 1. Visit HGTV.com for all the details about the sweepstakes. How do you think it compares to the Green Homes of the past few years? The HGTV Smart Home 2013 in Florida: Wanna Win It? What Do You Think About HGTV’s Green Home 2010? Wow–reading a lot of these comments–I am surprised. I think too many are too harsh. Or they just don’t ‘get it.’ Or they don’t see the architecture and the farmhouse influence. The stone and height with the colour choice–white and teal and burnt umbers–rich browns and yellows. It is in a nice natural setting. The Georgia room sits up high enough with deck on either side–so no A/C is prob OK for critters–not many snakes are going to crawl into that area. (for all those snake comments LOL) Sheesh. Get real people! Snakes are more interested in other areas than slithering up decks…not really the place where they want to find their food of choice. Esp when the deck is not covered with foliage. the home has a nice clean –yet warm feel to it–but they seem to have achieved the modern amenities to make it liveable in the natural setting. And most important so it will retain its value. It has good bones underneath the HGTV decor–so you can make it YOURS with time. I will never win it–but if I DID win it–I would love it! I’ve lived in a lot of farm communities–I love old farm houses. But I admit I’ve always wanted one that wasn’t going to fall apart. Here you go! Meet your 21st C farmhouse. Not really digging it. If you hadn’t told me it was supposed to have been farmhouse inspired, I’d have never known. I didn’t see last year’s, but this one is very confused. It’s nicer from the outside than inside. Ah…steps to carry everything in any direction. Not a retirees retreat but I know it could wear out the grand kids. Rustic-style is meh and modern-style is meh. So, overall, just meh. If they make a traditional-looking farmhouse with tradtional-looking mod-cons, I’d like it. The rooms feel so narrow and “tunnely” – the also seem very cluttered. It’s interesting… but I agree – I wish for more farmhouse, less modern. That entryway into the stone foundation is certainly a throw-back though. I thought that was very clever! It doesn’t seem a very practical house for a Southern climate: not enough overhangs or porch roofs and no screens anywhere. And a horrible place for anyone with mobility issues. Click the link to HGTV.com at the end of the post–they’ll tell you how to enter! It’s definitely not my style, but I certainly wouldn’t complain if I won it. A bit too modern for my taste as well…agreed about the farmhouse inspiration–glad they told us…that garage up on the hill was just inconvenient–however, I did think the outside of the house was architecturally interesting…I didn’t care for any of the modern cabinets/woods except the wood floors. Dust ruffles will continue at my house since old bed frames just look naked without them…besides, dust ruffles hide dust bunnies! Doesn’t do anything for me. That has got to be more than 2300 sq ft. I like that it is on the water. I do not like anything at all about the house – the multi-stories, the decorating looks like it was done by the show that stuck hay to the walls of the family room, there is nothing farmhouse about the exterior or interior, the bland architectural features, the small/narrow rooms. Question – is that water or the street? If it’s the street, I just lost my only reason for liking the house. street. looks to be a small lake down the street. Think the stables are behind those buildings up the street. Like the home personally. Biggest downfall would be that they look to be set up to build all around you. Ick. I don’t want to ever live in Georgia, so that’s where I start at. TOO many snakes, and bugs and critters, to EVER have open glass doors to the outside. I do like the office, but that’s about it for me. Farmhouse inspired, ? not at all that I can see, but I live in New England, so maybe I just can’t stretch my brain enough to see where they got farmhouse from, since we’re surrounded by real ones here. Please DON’T move to GA. There are enough Northerners here already. They took a risk here, they didn’t play safe and they definitely did not make it for the marjory of viewers. Have a great week! Big hugs to you, my friend. I really would not want to win it – first there would be the tax to pay, then trying to sell it would probably be difficult due to the economy and the very small market that would like this home – meanwhile, HOA fees (if applicable), taxes, insurance, utilities, maintenance,… would all be an expense. I agree with you. The interior is not farmhousesque. Can’t say I love it or even like it. I hate the front basement entrance – it’s not attractive at all. I don’t like narrow door openings set back like this one..it’s dark and scary. What were they thinking? The curb appeal is lacking to say the least. I did like the craft/office in the open hall upstairs foyer area. I haven’t seen the show – I don’t watch as much HG anymore unless its Sarah Richardson – I can’t get enough of her design. Okay bold statement: I am sick of Chevron prints and stripe walls. I am disappointed in HGTVs house decor. I would have thought we would see something cutting edge. Something fresh or new. But, this house looks like someone went into Pinterest and kept a folder of looks and went from that. I swear we have seen this house in the CO green house and the Utah house. It’s all looking very similar. If I won I wouldn’t complain. I’d just redecorate and have a yard sale. I’d have you advertise on her of course and give you a cut of the proceeds and of course give you a month a year at the homestead. HA! I agree, just “eh”. Not wild about the home overall but I do love the kids room…I can see my boys all over the ladder. I also love the little crafting area. ….Siding ‘used differently’ and metal roof does not a farmhouse make. Especially if that is the only two things the designers are going to point out. Saying it’s a ‘simple form’ of a farmhouse is being generous I think. From the pics, I don’t see anything ‘farmhouse’. It simply looks like a modern house built on a stone basement. Inside I see nothing ‘old’, unless one wants to count the wagon wheel lamps in the dining room, but even that is a stretch. That which is supposed to look ‘old’ just looks modern with a wood veneer. I’m not signing up for this one, but if I did and if I won, the siding and modern windows would be the first to go. Then the paint on the inside. Then the tile. Then the carpeting. Then the…. Does anyone know if once these houses are “won”, if the winner actually ever moves in? I remember reading something about one of these houses, maybe it was Napa Valley, that was never lived in and sits empty today. I venture to guess more winners take the cash, leaving some real estate broker in these towns to sell something that is odd man out. Without knowing who the interior designer was, after just a couple pictures, I knew it wasn’t Linda Woodrum. She would have made this house oooooh so much better. The taste level here is really low and the choices of colors, fabrics apparently meant to make some kind of statement, but they bomb here. Actually, Linda Woodrum did do this house. She was featured in the special. This house is having an identity crisis, it just doesn’t know what it wants to be! Frank Lloyd Wright meets Sleek Modern meets Farmhouse???? Sorry, I’m not buying it, it just doesn’t work and I don’t like anything about it. Yeah, I would definitely want A/C in that room. Yes This! The designers/planners didn’t take into account that this is Georgia and it is hot, humid and, often miserable, for a minimum of 9 months of the year. And if it isn’t hot & humid, there’s the bugs. The Georgia Room will be unusable without air conditioning and drapes of some sort to block the sun. And they obviously don’t understand that Georgia does get ice & snow storms occasionally, that garage set back and all the steps to the house will be a nightmare. The Georgia room (and I’m speaking as a native) seems like a stupid idea. We do have a lot of bugs/snakes/critters/pollen to make simply opening up glass doors to your house impractical. If you don’t open the doors, it’s just going to function like a big oven for most of the year. Very impractical, and seemingly designed by someone who’s never set foot here. There’s a reason why we love our covered and screened in porches down here! Dosen’t look very farmhousey to me. How many people actually keep these house they win? Don’t the majority have to sell because they can’t afford the taxes? This isn’t nearly as expensive as HGTV’s Dream Houses are. It’s under a million. It’s a lot smaller, too. They also give you $100,000 to put toward taxes. So the Green Home might be easier to hang onto if you won it! It certainly is a very MODERN modern farmhouse. I like last year’s home a lot better (though I would have made a few color/decor changes). This home doesn’t do anything for me. It also seems to waste a lot of space with various sitting rooms. I’d rather see a mud room, laundry room, and a more user friendly kitchen. I’m with you on the headboard in the master bedroom. It completely clashes with the stripes on the wall. And I’m not crazy about the non-airconditioned sunroom. Even if the windows/doors open to allow a breeze through it won’t help that much in the middle of a Southern Summer. Plus the mosquitoes would fly in and attack you. I don’t think I would even consider registering for the house. Gift taxes on it wouldn’t even be worth it. Don’t much like anything about it, except that it’s green. The rectangular box forms with simple gable roofs may be farmhouse elements, but it ends there, in my opinion. I understand that it’s built into a hill and thus is vertically oriented, but too many levels for me (now that I’m older and think about such things). I like the Georgia room and the homework/craft room OK. I really don’t care for the master bedroom decor at all. Serenbe is a lovely community and they have some great examples of newer farmhouse looks. This isn’t one of them. I won’t be entering. My favorite thing in the house is the picture of the bulldog. That was my favorite thing too! The only thing I felt about this house was claustrophobia. Totally. I live in Georgia in a small passive solar home I designed and even marked the foundation settings and orientation so that I would always be facing south with great cross ventilation. I never have to turn on AC until late in the afternoon when western sun starts to broil. As far as the snakes and bugs I keep grass mowed and never go into woods in the summertime. It’s wonderful ! But in that house I would have to stay outside all the time. I agree with Ann. The bulldog art is the only thing I like. I don’t like the grainy look on the cabinets in the kitchen or the bathroom. Seems really busy in the decor. You’d think farmhouse would mean a little less. I really like it. There a few quirky things that I would have to get used to (not that I’m actually going to win), but overall I think it is very nice. The front entrance is something that would rarely be used except to bring groceries in. You are closer to the kitchen down there and there are less steps. The master bedroom needs a calmer rug (too busy) and a solid wall color. But I like the headboard. All those steps would help keep me in shape. I agree with a previous poster about the screened in porch and AC needed in the Georgia room. I’m from NC and mama didn’t raise no dummy! No need to sit steaming hot while mosquitoes munch on you. You’re not going to feel a whole lot better just because you can congratulate yourself on your small carbon footprint. Has anyone noticed that the writers of the HGTV shows are adding conflict, even arguing, to the scripts? The show Love It or List It has couples arguing with each other, with the designer, with the realtor. I find watching it uncomfortable. Even on Candice Olsen’s recent show, she had cross words with her contractor. Also, the couples on House Hunters are beginning to bicker. What’s going on? They must be trying to appeal to the idiot reality TV lovers. I’m with Carol M. Haven’t watched HGTV in forever. Have to agree with many it just left me meh. It’s lovely for a magazine shoot but not to live in. What’s up with all those stairs to get anywhere? And a garage uphill from the house? Yeah that will rarely be used. But I admit I will enter, hope I win and then sell it to build my dream green house. Yes I agree not really digging it. It would be an awesome vacation home for whomever wins it! Not for me. It just doesn’t seem all that practical, nor inviting. HGTV is becoming more and more of a disappointment. I hardly ever watch it anymore. Way to contemporary for my taste. Not what I would envision as “farm house”. I didn’t see the special. I wasn’t really wowed by any of the rooms. There is NOT a farm housewife, anywhere, would want this house after sloppin the pigs, feeding the chickens, loading the hay, tended the kids and changing diapers and then having to climb up and down all the stairs in the house. She would be too tired! Off topic, but do you have any photos of Regina’s house on Once Upon A Time. Great house (except for the tree wallpaper in the den)! only thing I liked was the lack of dust ruffles on the beds. It is definitely not my style, but it does fit the “arts-i-ness” of Serenbe. BUT, on the other hand, Serenbe has some beautiful houses styled like farmhouses with traditional styling (front porches, wide hallways, beatiful staircases)…and they have a great traditional barn area and vegetable gardens. It must be in one of the newer more modern area of Serenbe. The last time we were there, many of the empty for-sale houses were traditionally styled (and gorgeous). Maybe since those weren’t selling, they decided to go in a different direction. Anyway, not going to enter to win this…much rather win one on the water from Coastal Living. The furniture…It kind of looks like the modern version of Green Acres, where some Manhattan Real Housewife type brought everything with her from her Upper East Side duplex and stuffed it into this suburban house. Speaking as someone who OWNs a farmhouse: this is not one. This poor house is confused. Is it a farmhouse? Or a townhouse? Or a mid-century modern? And that’s just the design and layout. Then there’s the decor. Contemporary or traditional? Eclectic or MCM? But the real question is: who paints a narrow room orange? I don’t like this house. The layout and design were poorly done and I don’t see anything that remotely resembles the farm house style. Plus I do not like contemporary. That’s why I’m passing on this one. I love the Georgia Room, but maybe that’s just because we are building outdoor space right now. I do NOT like that entry. It’s a little too modern to be called a farmhouse for me, but I like it better than last year. Before I got to your last comment about the garage – I was going to comment that the people who designed this house must not buy and drag groceries into their homes. When I looked at the front door – all I could think was the many trips up the stairs with groceries, dry cleaning and ever other errand – and what a pain that would be. I agree with Holly (above) – it’s a townhouse, not a farmhouse. I like some of the woods inside – I’m guessing they are sustainable woods and/or bamboo – but otherwise… eh. I do love the hallway – office/craft area – that is a good use of space. Decorating wise – it’s too busy for me ; stuff on top of stuff in every room. Maybe those bedrooms are bigger than they seem? By just looking at the pictures, they seem to be tiny. As everyone has said, this is not a farmhouse. I wonder when they design these houses that they take into consideration where they are building. Georgia would be a bit more traditional than say out West. I do like the outdoor spaces. That orange room? Too much. I love that color, but that’s just too much. And yet another TV over a fireplace! When will the madness end? UGH! NOT a farmhouse at all. I didn’t like anything about this house. I wish I could think of something nice to say, but it looks dated already. Any idea if the bulldog picture in the kids room can be purchased somewhere or was it done especially for the Green Home? Big UGA fans in our house & would love to have one for my little boys room. Enjoy reading your blog, it’s a daily escape for me! Hop on over to HGTV’s Green Home main page that I linked to. They should have all the source info there and will hopefully mention that picture, too! You know what I’ve been noticing a lot lately, especially in more modern design, are ceilings the same color as the walls which I do not like. It creates a box and who wants to live in a box?? Great home and fabulous location!! PS I forgot to say I wouldn’t enter the contest for this home. It feels really cold to me starting at the front door. I would have thought that was the way to the garage. Georgia is truly gorgeous… just not the house. I agree! There must be a feng shui issue with this house/door – because that was my first thought as well… “I don’t like this door.” It does not feel welcome like a place I’d want to come home to. Wow! Definitely not getting a positive impression and I agree. So much seems off balance. I’m not entering the contest to win it. I don’t care for it at all. I can’t get past the front door. I hate when doors are in a cave like that. It feels so cramped. Also, a home outside of Atlanta and no AC in the sunroom? Yikes! I like the modernism of the place, but farmhouse? I don’t see it. I HATE the placement of the front door! I’m with you: It definitely looks like you’re entering through the basement. It has such an odd look about it. This is what a fresh interpretation of a well loved style looks like according to these architects— taking a modern form and building it with traditional farmhouse materials. I have also seen traditional farmhouse shapes built with space age looking materials…none of these are not intrinsically displeasing but they certainly challenge that traditional meme of white clapboard, gable roof, porches, etc. Disappointed yet again. I’ve yet to like any of the green houses that HGTV creates and the Dream Homes are hit and miss every other year. I’d really like to see a new Interior Designer brought in other than Linda Woodrum. I’m constantly disappointed in the kitchens. I’m undecided whether I like it or not. This is too contemporary and modern for my tastes and the entry does seem like it is leading to a basement. I’m not too keen on it, although I do love the outdoor area as well as the craftroom. Meh. Not my taste. Won’t enter. I haven’t cared for the last couple. Each to its own. It is interesting but I much prefer my quirky historic farmhouse. I like knowing that I live in a rich piece of history, not a second rate imitation. I think that the House is really nice to move in I know that when God give you something it is a blessing And if it is God will I will take the home and do right by it . Laundry room should be next to master bedroom. Attached 2-stall garage a must. It is an awkward lot, so the house had to be built to best use the space. The detached garage and lower level font door are both due to constraints of the lot. I wonder if there’s space for an elevator. Also we live in a Neo Traditional neighborhood, like Serenbe, and there are strict convenants about what can be built. I don’t think the house is at all Farmhouse, more like industrial warm chic. I wouldn’t have designed it, but it is a pretty house. It just feels impractical for everyday family living. I agree it would be a fun vacation house! The foyer looks like a windowless cellblock. At first I thought the drywall wasn’t finished, but no. I agree, cluttered, narrow, and lots of stairs/steps. Add hotlanta to the mix and I’m not a fan. From the deep off center entry cave one needs bring guests up a flight of stairs, through the kitchen and dining room before, at the other end of the house, landing in the living room. Also MB clothes need to go to the other end of the house and up stairs to get to the laundry, not to mention the hike to the garage. I’m think the name should be changed to The Exercise House. Also I’ve decided Linda either owns the place or has something on someone, because we beg and plead for them to get another Int Designer, but gawd bless her she just doesn’t go away. I do like all the indoor/outdoor space (wanted to say at least something nice), but I wont be entering. Not liking that weird squinchy front door at all. dear linda w. I dont know why every body is so down on you. I think you do a real good job. The house does have alot of steps, but that doesnt hurt most people.A lot of people are to picky. I like the house, but if i won it i wish i could afford to keep it. Loved the kids room, the windows and the outdoor areas, but hated everything else about the house. Too many colors & patterns that don’t go well together, too modern and DEFINITELY not matching a “farmhouse”. Looks more like a posh modern townhouse that belongs in Connecticut or NY. Besides that…EVERYTHING needs to be air conditioned in Georgia! Score of 1-10 on this house…I’d have to go with a 1 for sure. Not good at all, especially for something so “expensive” by most people’s standards. Being an Architect myself, I don’t know where their heads were when they designed this place. Not functional or inviting at all with the dark, dreary spaces and long, crowded rooms. The way things are laid out, it also makes it impossible to get a new look by moving the furniture around, which a LOT of people want that option. Honestly coming from a city gal this makes so much sense to me… The decor is very busy and I personally like that. I’ve lived in the City and the country and I have to say the decor would make it a little more comforting for a transition. I wouldn’t change much about this and would be extremely thankful since my family don’t even have a place of our own. I think it’s lovely and could only hope to be blessed enough to win something so wonderful! My Fiancee and I would for sure move our children here and really enjoy ourselves. He wouldn’t mind relocating and finding a shop to work at. I saw the Green Home last week, and found humor in a few things. The cute outdoor sitting area off the master bedroom featured a “Dog House” (with matching decor to the master bedroom). I joked with my friend that now we know where to send our husbands when they are out of favor! Also — did anyone else catch that the door to the master bath “water closet” would not close – it opened IN to the room, but could not fit past the edge of the toilet to close. (they HAD to notice that when they hung the door!) It’s Permanently open (not a problem I guess for tours and would keep folks from using it I guess). We were told that “there are still a few items that need fixing” (and that was one of them). Master bedrooom closet – Hardly ANY hanging space for dresses (maybe 2 ft in width). In fact, that master closet would have struggled to fit my husband’s clothes so have no clue where mine would end up! Interesting! So odd that the door wouldn’t close. Thanks for the on-the-field report, Gail! i feel in love with the green house sent first time i saw it on hgtv and my hole family loves it to my daughter loves the gmc and my husand love the every thing of the house and i will happy to be the one and i believe in hgtv and they did a good job on the house. I LOVE IT!!! Would do anything to win it. I can picture my family living in it. They did a great job. Im in love!!! This incredible home knocks my socks off! And the icing on the cake is that it is a GREEN home! It represents the future (hopefully) as our society becomes more interested//involved in protecting the world’s natural resources and living as green as possible! It is a wonderful that “living green” doesn’t mean living in a tree (not that there’s anything wrong with that)! HGTV has demonstrated this with the 2012 Green Home and I’m sure the lucky winner will appreciate residing in this unique home; it will be the opportunity of a lifetime! i’m very very up set i didn’t win the 2012 green house from hgtv i enter over 280 times why i didn’t win? It’s truly very difficult in this full of activity life to listen news on Television, thus I only use world wide web for that purpose, and get the hottest information.